Well made, with power to spare! Now back to the project. In building my deck, I affixed the ledger board to the house with twelve ½" x 10" galvanized lag screws (3.5" of ledger board, 2.5" of wallboard, 10" of sill beam). I pre-drilled each hole to depth with the DA4031, then (using a ½" drive socket adapter) turned each lag screw in flush (final tighten by hand). These were done one after another, on a hot day, with no sign at all of fade from the drill. The final tighten required a ½" x 18" breaker bar, so I know turning the lags in was no cakewalk! I then used a ½" x 12" self-feed auger bit to drill sixteen holes through 9" of lumber for the lag bolts on the cantilever support. The DA4031 has also drilled all the holes for my railing support posts. Final verdict? Nothing on this project came close to stressing this drill. I couldn't be more pleased with the quality of construction, ergonomics, or power. I will probably never come close to using this drill to its full potential, but I like having a quality tool with more than enough power to get any job done. The DA4031 has both these bases well covered. I've been using this drill for a few weeks and my only regret is that I waited so long to buy one. 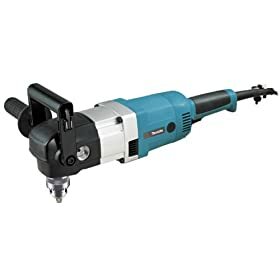 This was purchased to replace another angle drill I had been using (yellow and black) that didn't perform to my expectations, when it finally died I went with the Makita. It's not the least expensive, but I've always had good experiences with Makita products in the past, so the choice was easy. I've been boring holes in treated lumber, studs, joists, glue lam beams, ect.. with a self feeding bits, and this drill powers through with no problems. Only downfall is the Allen key holder that is built into the grab handle, the wrench tends to fall out sometimes, this didn't keep me from giving it 5 stars, I just leave the key in the case.